Several years ago I was lucky enough to be invited to watch Tom Jackson work with a local band in a studio in New York City. I have never seen anyone do what Tom does. For lack of better words he is a live music producer. He helps bands make emotional connections with their audience and either improves a band’s live performance or gives them a whole new perspective on how to make their live show work. 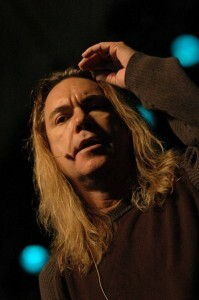 Tom has worked with Taylor Swift, Casting Crowns and Jars of Clay among others. Thanks again for taking the time out of your busy schedule to speak with me. I get a great deal of requests from the people I work with to give them constructive criticism on their live performance but my suggestions are usually limited to taking the microphone off of the stand, move around more and remember to engage your audience. You on the other hand have made helping a band with their live show an art form. Please tell me in your words what it is that you do. I’m a live music producer. I do very similar things to what are record producer does except I deal with the show. It has to do with re-arranging the songs and creating moments. If you asked me in one sentence what the goal of my work is, it is to create moments in a musician’s shows. How you create those moments can be verbal, visual, musical… There is a bunch of different ways. I have been fortunate how to figure that out and do it. I’ll tell you what it is not too- it’s not choreography, it’s not drama, it’s not dance. It’s not goofy stuff. What would you say, having done this for a number of years, that the top three show killing behaviors are and what is the philosophy you use in helping people to correct these behaviors? Not being teachable kills the show more than anything. To me by far that is the biggest thing. The funny thing is that we have been trained in the music industry that of course when you go into the studio you get a producer, of course you get a bio or an EPK produced by professionals. You get help every step of the way but when it comes to the show you are magically supposed to know how to do it because you are a performer or an artist and that’s a big killer because it’s not the case. That’s definitely a big one. Do you run across an archetype? Is it the musician just standing there gazing at their shoes or maybe failing to make eye contact? A big thing is an artist not being able to emotionally connect with their audience. Everybody is communicating from stage- always. The question is what are they communicating? What they feel like they are communicating and what they are really communicating are very often two different things. They don’t understand that non-verbal skills are important. How you stand, where you stand, your countenance, your authority and who you are… So the non-verbal skills are just randomly made up and sometimes artists copy other people who don’t know what they are doing. Interesting, that leads into my next question. Sometimes I see people who are killing it live musically but it they are shy or introverted and it is apparent both on and offstage. It is just obvious that they are not comfortable in their own skin or in the role they are playing onstage. Unless you are Robert Smith from the Cure this kind of behavior can really work against you. Does your work involve breaking people out of their shell? I am guessing that would apply both on and offstage. Can you offer any advice to people who might be in that situation? Yea, in fact it is one of the four areas that I work with when working with an artist. It is the psychological, the emotional and spiritual part of who they are and who you are is more important that what you do. It takes a relationship to be able to prod people and free them up. What you want to do is to create freedom in the room, in a rehearsal room and then obviously in a venue that you are playing in so there can be an emotional love fest. If you are bound up in your emotions or self conscious all the time- then it’s more than likely not going to happen. And this is something that you help people learn? Yes, in fact one of my biggest comments over the years has been that “Tom helped free me.” It’s helping people deal with fear… It’s what I call authority. Being able to have authority on stage – it’s not arrogance. In fact, authority comes from humility. I can’t teach authority but I can be a psychologist and help lead them to that place. I can show them what IS working and through that help them gain more confidence and authority a process that hopefully perpetuates itself. Hopefully they gain more and more and more and eventually this performer becomes a monster, in a good way. That’s the misconception of what I do. That’s really only 10-15% of it. The re-arranging of the songs, the psychology we have been talking about and the vision for the shows are more important. One of the reasons artists do not succeed is because they have lost the vision for their shows. They are just out playing songs and without vision you end up nowhere. So it is much more than choreography. That is actually the thing that I spend more time on than anything. It makes sense that people would spend a great deal of time on arranging a song for radio but it doesn’t make sense that they wouldn’t spend time on arranging a song to go over well live. I also wanted to talk to you about the difference between large and small shows. You help people prepare to play in front of big crowds, as that is the end game in your work, but can you explain what the difference would be in coaching someone to play in front of a large audience vs. a small audience? Is there a difference in stage behavior when playing in front of 40 people at a club vs. playing a big shed? Is the emotional connection you often speak about different in those two situations? Conceptually the answer is there is no difference. You still need to make an emotional connection, technically there are still things you can do while performing, songs do need to be re-arranged for live performance and you still need a vision. Yes I spend most of my consulting or producing is with acts that are signed but most of my teaching is for indies who are just coming up. Honestly, I do very little different with someone like Taylor Swift. Sure I have more tools to play with, you know, most people don’t have a waterfall to fall under at the end of their set. That’s not the norm… but the concept is the same. The waterfall is the payoff. We may not have a waterfall but what payoff can we use to get the response in a club with 40 people that will get a response in that room. If you practice that… I have never seen an artist who developed these concepts not grow. In watching you work you discussed the “cheese factor” it was great of you to point out that too much rehearsal and too much planning can backfire. When people don’t have someone like you to give them feedback and are trying to improve their live show- how do they know when they have gone too far? Is this something they have to test live? I try to get rid of the barriers between me and the audience and not just the barriers. When I walk into a venue mostly everything is set up for the production people. The second thing it is set up for is the artist and the third thing that it is set up for is the audience and that’s backwards. It needs to be the audience first, the artist and then whoever is setting up the gear. I fight for every inch I can so I can have an emotional connection with the audience. I have played gigs where I have fought for an extra eight inches so I could get that much closer to the audience at the right time. I’ll finish with this. What make a good hotel great? It’s the little things. It’s not flying beds. It’s fat towels. It’s a phone by the toilet. It’s a mint on the pillow. It’s all the little things. There is not much difference between a good hotel and a great hotel when it comes down to the basics – bed, TV, dresser, bathroom but – and this is for any artist reading this – who gets more money? So that’s the difference between the Holiday Inn and the Ritz Carlton. Totally and we have this routine of taking whatever comes out way and not going the extra mile and not learning the things we are talking about to make that difference. Artists need to provide their audience with an experience to have an emotional connection, not something random. You asked me earlier about mistakes artists make – every artist has experienced those moments on stage that are magical. For some reason the planets align, you can actually hear the monitors and everything is working and there is a love fest in the room. Here’s the problem- they don’t know why it happened. The next night you go out and do the exact same thing and it won’t work and the artist doesn’t know why. Without sounding arrogant, I know why.